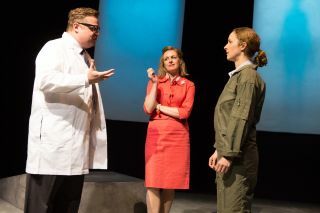 Jerrie Cobb (played by Amanda Quaid) listens to Randy Lovelace (played by Edmund Lewis) as Jackie Cochran looks on (played by Andrus Nichols) in "They Promised Her the Moon." NEW YORK — A new off-Broadway play follows the early life of Jerrie Cobb, a pilot who became famous in the early 1960s as the "almost-first" woman in space. Geraldyn ("Jerrie") Cobb was part of an independent research project run by Randy Lovelace, a NASA contractor who also tested the original seven astronauts in NASA's Mercury program, nicknamed the Mercury 7. Lovelace applied the same series of physical tests to 13 women, the "Mercury 13," hoping that they could also qualify for spaceflight. "I immediately fell in love with the story," the show's director and producer, Valentina Fratti, told Space.com. "I couldn't believe I didn't know about Jerrie Cobb." Fratti had been named for the first woman in space, Valentina Tereshkova, but hadn't known about the "almost first," her American counterpart. The play depicts Cobb's early life and her trajectory during and after her astronaut testing, when the program was disbanded because Lovelace didn't have permission to use a Navy site for additional tests. In the play, Cobb also speaks at a congressional hearing in 1962 about allowing women into the space program, testifying along with John Glenn and Jackie Cochran, an acclaimed pilot and crucial sponsor of Lovelace's research. Cobb's and Cochran's relationship weaves through the story, showing how two very different female pilots fought for a place in typically male spaces. Playwright Laurel Ollstein premiered the first incarnation of the play in 2012 at the University of Oklahoma, and the work went through multiple workshop readings after that. Ollstein and Fratti agreed the script was ready after a reading in October 2016. "I decided to move quickly because given where we are now … and having an 'almost-first' female president, I felt this is a perfect time," Fratti said. Fratti and Ollstein said they were both drawn to Cobb's love for flying, and how fiercely she fought for the opportunity to go into space. Cobb was the first to complete the physical qualification tests out of the Mercury 13 and became the public face of women destined for spaceflight. "Jerrie is fascinating to me," Ollstein told Space.com. "It's a tragic story, but it's also a story of so many women who are unbelievably capable and then, just because they're women, aren't able to go as far as they could." The requirements for astronaut candidates back then, to be graduates of military jet-pilot programs and to have engineering degrees, were not open to women at the time, according to a NASA reference page. Cobb and others argued that extensive flight experience could make up for that shortfall, and that not all of the astronaut candidates actually had that background, anyway. For their part, the cast dove deep into the story as well, Fratti said. "The cast is superb," Fratti said. "Their instincts are terrific, and their passion for this story actually is on a par with my passion for the story. It's not often where I think your entire cast feels the need to tell a story so deeply — that's a very, very exciting experience." Amanda Quaid, who plays Cobb, even took a flight lesson to better understand her character. Ollstein said that the most challenging aspect of the play was making sure it wasn't depressing in the end. "It's tragic, and it's not fair and all that, but I don't want to tell a story of 'Oh, the men won't let you go up to space.' That's not a story I want to tell," she said. "I want to tell about somebody whom we owe a lot to … and I guess I want to celebrate her in this play, too," Ollstein added. "How strong she was, and how she loved something so much and she worked so hard for it. And it made a difference." Ollstein said she was thrilled that people left the play (or intermission, back when there were two acts) researching Cobb on their phones. The playwright added that although the story has been depicted many times before, it seemed to still be relatively unknown. "For me, Jerrie made a difference," Fratti said. "She paved the way, though her personal story was filled with disappointment. "I think we're honoring Jerrie, and I think we feel a respect and a responsibility in that," she added. "And, of course, it's not just Jerrie — this is Jerrie's story, but it's for all the Mercury 13 women."